John’s gospel takes place in Jerusalem during the feast of Tabernacles. The rituals of this feast use water and light. But there is also a ritual where the priests gather outside the east gate of the Temple area and gaze away from the Temple toward the east. At the moment of sunrise they turn their backs on the sun, face the sanctuary of the Temple and recite a prayer recognizing the God of Israel as the one true God to whom all praise and allegiance are due, “Our fathers when they were in this place turned their backs toward the Temple and their Faces toward the east…as for us, our eyes are turned toward the Lord”. What a simple, beautiful statement of praise and fidelity. In Yesterday’s gospel a woman stands before Jesus with her head bowed down. “Should we stone her to death for her sin?”, they ask him. But when her accusers drift away one by one, she is alone and looks at Jesus while he talks to her. When the poisonous serpents bit the people, killing many, the remedy was to look upon a bronze serpent raised up high for all to see. Those who did this, even if bitten, recovered. 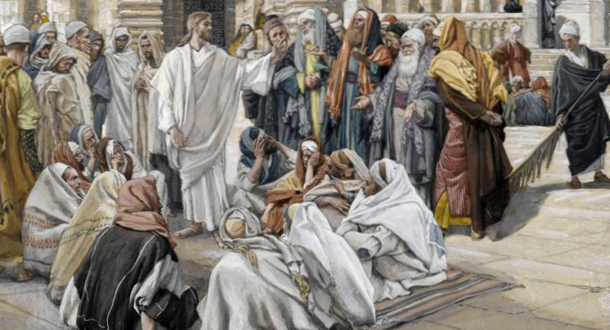 The Pharisees, unlike the temple priests, the woman from the previous gospel or those bitten by the serpents in the desert, do not see. They turn their back to the light of the world, the source of living water and the one sent from the Father. Soon the Elect will see themselves in a new way as priest, prophet, king or queen and other Christs when they come out of the waters of Baptism. The rest of us will renew our vows of Baptism and once more break the crest of the last hill of our Lenten desert and behold the land flowing with milk and honey. It is true that the brighter the light the greater the shadow. We see the light but we become blinded to other things, things that are most important. We might consider today’s Pharisees as victims of some sort of light blindness. Let us take our lesson not from them but from the temple priests who turn their backs on the light of the rising sun to look at what cannot be seen in the Sanctuary. Let us look to the Lord who may be concealed, disguised, or not look at all brilliant. With simple praise and fidelity let us offer prayer that all may see the light of Christ especially when blinded by other values. Let us stand with those in darkest night to help them wait for the coming light. Error: Error validating access token: Session has expired on Monday, 18-Mar-19 14:16:37 PDT. The current time is Thursday, 18-Apr-19 19:24:50 PDT.